Amy is an associate with the law firm of Elk & Elk, Co., Ltd. She concentrates her practice in the areas of estate planning, estate administration and guardianships. As the head of the firm's Probate Division, she is able to provide vast services to the firm's clients by tending to all of their probate or estate needs in-house. 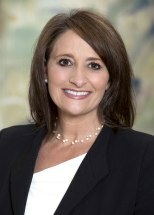 Amy has been recognized as an "Ohio Rising Star" by Super Lawyer's magazine for 2010, 2012 and 2013. Amy was selected to the Ohio Super Lawyers list in 2016 and 2017. Amy has lectured for the Ohio State Bar Association, the National Business Institute and various local professional groups and organizations on estate planning and administration issues. Before joining the law firm of Elk & Elk, Co., Ltd, she practiced at a boutique firm in Chagrin Falls, Ohio where she focused primarily on estate planning, estate administration and domestic relations law. In her spare time, she enjoys traveling with her family and watching her two boys participate in various sports.